A Solare Intelligent Energy system integrates the smart devices in your home to create a truly intelligent home that is more affordable, comfortable, secure, healthy and efficient. Today, many of our devices are independently connected, including appliances, vehicles, solar systems and batteries. However, the potential of these smart devices is limited when they are working independently. By integrating the control of these devices and optimizing their operation based on personal preferences and external factors (e.g., seasonal and time of use electricity rates, power outages, solar production, weather) the Solare Intelligent Energy system allows you to maximize comfort, while keeping your home healthy and secure, and reducing your energy cost. For example, smart thermostats by themselves have been proven to keep a home comfortable and save 10-20% on energy cost by running heating and cooling equipment only when needed. However, when a smart thermostat is part of the Solare Intelligent Energy system, it will optimize operations based on solar production and time-of-use electric rates. It will cool your home before you get there when the solar system is exporting electricity to the grid and the electricity rate is half of what it will be when you get home, so you are arriving to a comfortable home instead of a hot one, and cutting the cooling cost in half. Similar strategies can be employed with furnaces, water heaters, electric vehicle chargers, etc. 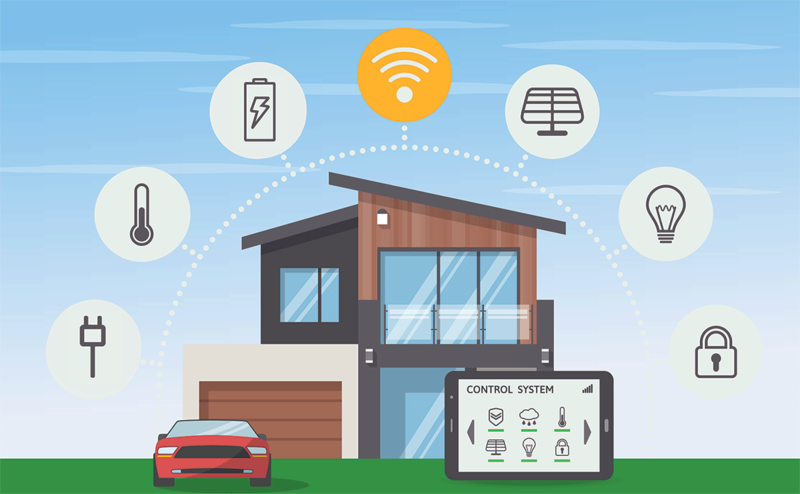 A Solare Intelligent Energy system uses battery technologies to secure your home in case of a power outage, maintaining power to your secure home systems (electronic gates, door locks, garage openers, cameras, occupancy sensors, etc.) as well as backing up power across your home. Furthermore, the battery will store power when the cost of power is low and discharge when the value of power is high for added rate savings through what we call ‘rate arbitrage’; buy low, sell high! This system will also provide the home the ability to use more of the solar system’s energy and remain powered in the case of a black out. Clean reliable power 24 hours a day. Our system provides the ultimate energy and automation technology platform, today and in the future. The Solare Intelligent Energy system will update settings automatically as electricity rate structures change and new utility programs become available. Furthermore, by partnering with leading home automation and smart appliance manufacturers, equipment updates will be sent over the air to always comply with the latest communication protocols and technologies to insure your home always stays connected.